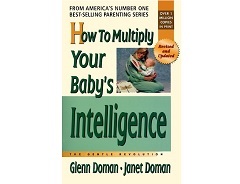 Revised and updated edition By Glenn Doman® and Janet Doman. Learning begins at birth or earlier, say the authors, not when formal education begins at age six. They draw upon nearly a half a century of search and discovery to show that mothers are the world's best teachers and that tiny children can learn virtually anything they are taught in an honest, factual and joyful way. The authors emphasize that the process is a joyous one. As this wonderful book demonstrates, learning to read, to do mathematics, or gain knowledge of any subject is not a chore, for either mother or child. It is a source of fun, enjoyment, achievement and pride. This book contains illustrations of dot cards, word cards, and Bits of Intelligence®.